Toulon will pay tribute to Jonny Wilkinson in his last match before retirement by wearing commemorative jerseys with his name stitched into the collar. 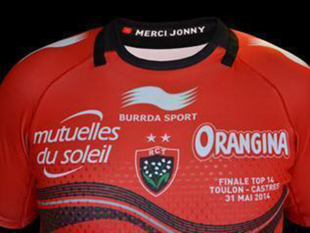 Wilkinson and his Toulon team-mates take on Castres at the Stade de France on Saturday in the Top 14 final, with the specially-designed shirts featuring the words "merci Jonny" on the inside of the collar. Wilkinson will hang up his boots after Saturday's final on a 16-year career in which he has won the Premiership, Heineken Cup, Six Nations and World Cup. The Top 14 title is one that has evaded him so far, but Toulon go into the final as favourites having topped the table in the French regular season. The unique shirts add to the outpouring of affection for Wilkinson from Toulon ahead of his retirement. The club's owner Mourad Boudjellal has taken the unusual step of applying to the French league to retire the No.10 jersey in honour of his fly-half, while director of rugby Bernard Laporte will welcome Wilkinson into his coaching team after the final. Toulon's shirts will also feature a second silver star above the club's crest, marking their back-to-back Heineken Cup titles. They take on Castres on Saturday in a repeat of last year's Top 14 final, which saw Castres secure a shock 19-14 victory.